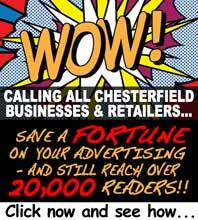 Chesterfield is one of over 300 markets taking part in the national 'Love Your Local Market' campaign inspired by the Mary Portas' report on the future of our High Streets. Love Your Local Market is being backed by Chesterfield Borough Council to promote the town's markets between 28th - 30th June. The campaign aims to attract new market traders and to highlight the importance that markets play in the heart of the local community, not only for retail but as a valuable community asset. Councillor Nick Stringer, Executive Member for Leisure, Culture and Tourism said: "Chesterfield market provides great value for money and a fantastic range of products. We're keen to attract new traders to the market and would encourage anyone starting up in business or even an existing out of town business to consider taking space during the campaign and see how well it works." Throughout the campaign new traders can rent a stall from as little as £10 per day. There are also 200 free car parking scratch cards up for grabs for shoppers spending just £5 on any open air market stall so on your next visit you can park for free. Graham Wilson, Chief Executive of the National Association of British Markets Authorities said: "This is the biggest national markets event for a generation and there is a real opportunity for markets to show what they can do for job creation and bringing town centres to life."